There’s no timeline to friendship. One friend came into my life in 2007. Ann Reynolds hosted our Sawyer Drive Ladies’ Gathering, surprising us with a special guest who lived around the corner. Ann said she was a special lady she had known since childhood. “She went to school with my mother and aunts. As an adult, I really got to know her,” Ann said. When this guest started talking, I asked for a pen and paper. I wanted to share her stories with others. After this day, we met often. She talked, I wrote. I read it to her, she edited. I submitted. Together we wrote eight “Ruth Remembers” columns, which were published here from 2007 to 2011. Her stories were a hit in our little ‘burb. You likely have read much about Ruth Sawyer Jividen, her homestead that was sold to the city weeks before her April 14 death, and the closing of Beulah Park, which was named after one of her aunts. Much history of our small town is linked to her family. After all, she was the last direct descendent of Hugh Grant, the man who cut down the first tree and built the first cabin here. So why write more, and why should you read more about Ruth? Ruth was more than the history she knew so well and lived for close to 99 years. She was an example to the following generations and had messages to share. All you had to do was ask her. Ruth could tell a story about growing up in Grove City with remarkable clarity and detail, remembering names, dates and places. At her memorial service at St. John’s Lutheran Church, Pastor Don Allman said she was not stuck in the past but understood how the past shapes us. “Ruth moved forward with the times, building on her foundation of faith and her experiences,” he said. She was ready to meet her maker. “Why am I still here?” she asked me weeks before her death. I reminded her that God knows the number of our days and we had to trust him. When we sang Precious Lord, Take My Hand at her memorial service, I knew that is exactly what Jesus did when she left this earthly life. When she was 95 1/2 (she made sure I included the 1/2), I asked if she would write a letter to Jesus for my book. I’m glad I had a pen and paper handy because she took one breath and said, “Yes, dear Jesus … ” and shared her thoughts. History connected them. They met five years ago when Harrisburg United Methodist Church was having its 200th anniversary, where people dressed in period costumes. Esta and her sister, JoAnn Freeman, borrowed bonnets from Ruth, but Esta first met her when returning them. “We hit it off right away. When her health failed a few years ago, I stayed with her till her strength returned. I was glad to do that,” she said. Esta was modest about the many ways she helped Ruth. Ruth’s many friends in town readily lent her a helping hand, returning years of her generosity. Don Yors, a lifetime resident, started working for Ruth’s first husband, Lem Seymour, doing odd jobs at age 13. He knew Ruth for more than 62 years and said she always made him feel like part of the family. Don became a master welder and blacksmithed as a hobby. He was making a rose for Ruth out of pewter. He was going to give it to her, but they didn’t connect. It was placed in her casket. Ruth touched many lives and will be missed, as her life becomes part of the Grove City history she loved to share. 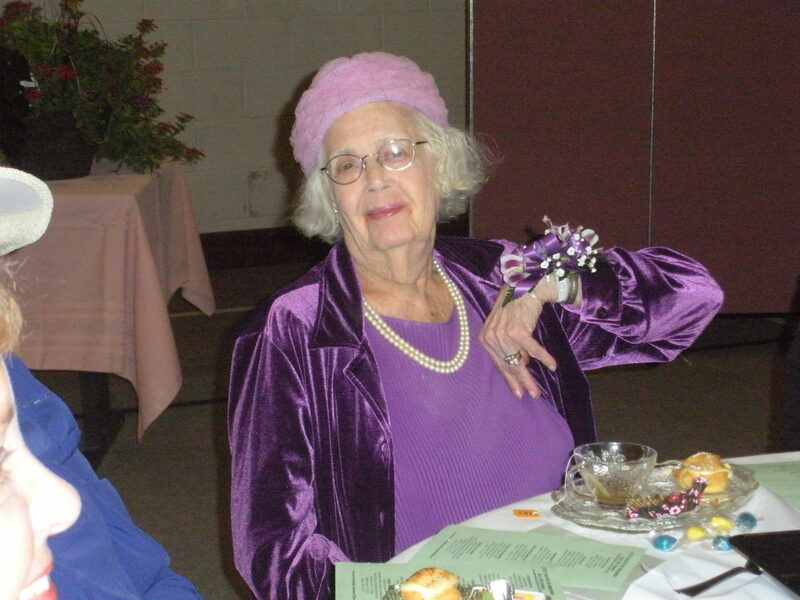 Ruth Sawyer Jividen, 2012 when she was honored at the Civic Women’s Club of Grove City, Ohio.